Skyber Byghan, meaning little barn, is a semi-detached reverse level barn conversion attached to the owners property. 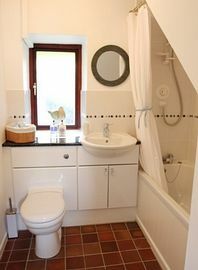 Has undergone an extensive refurbishment including a newly fitted kitchen and bathroom the cottage now has a fresh contemporary feel with a beachy twist. 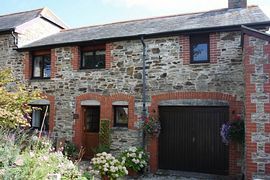 The cottage is situated in the quiet and tranquil village of Mithian surrounded by beautiful countryside yet is only one and a half miles from the north coast at St. Agnes and 7 miles from the City of Truro. The property has a double bedroom with hanging rail and chest of drawers, a single room with full size bunk beds and a small wardrobe and a newly fitted bathroom with contemporary white suite with shower over the bath. Upstairs there is a double aspect lounge with a two seat leather sofa and two leather recliner chairs, LCD TV with Freeview and a blu-ray player with a selection of DVDs. Off the lounge is a cupboard housing the washer-dryer, Hoover, iron and ironing board. In the double aspect dining room there is a large extending oak table and chairs with ample room for 6. 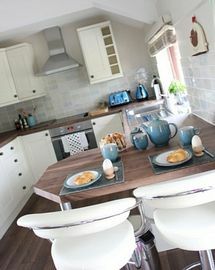 The newly fitted kitchen, with a small breakfast bar and stools, is fully fitted with a large integrated fridge freezer, dishwasher, single fan oven and ceramic hob. There is also a microwave, toaster, kettle and ample Denby crockery. To the front of the property is a small patio with table and chairs for your use. There is off-road parking for one car available at the property or alternatively there is unlimited parking in the village. The property is all electric and this is fully inclusive in the rental, heating is by night storage heaters and there is a log effect gas stove in the lounge. All duvets, pillows and linen are provided, including towels and beach towels. A travel cot, high chair and stair gates are also available on request. Skyber Byghan is a non-smoking property and no pets are permitted. Turn right at the Chybucca junction onto the B3284 towards Perranporth. Continue for 1 mile to the staggered junction at Pendown Cross. Here, turn left then immediately right continuing on the B3284. Continue for 1.5 miles until you reach a crossroads at the brow of a hill signposted left to Mithian. Turn left at these crossroads and continue for 1 mile into the village of Mithian. Follow the road over the bridge and up the hill until you reach a junction with "The Miners Arms" situated on your right. Turn right here and follow the road around the corner. "The Roundhouse" and "Skyber Bhygan" are situated 100 yards further along on the left. Nearest Rail Link is Truro Railway Station which is situated 7 miles away and has regular services to London Victoria and London Paddington. Open all year round, Friday changeover, short breaks are available, either Friday to Monday or Monday to Friday. 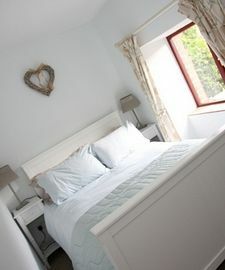 What our guests think... "...what can we say, the cottage lives up to the stunning location it is set in." "The interior is finished to a very high standard and is equipped with everything you could possibly need for a relaxing, comfortable and enjoyable holiday" "....we would like to recommend this stunning cottage to anybody who would like to visit this part of the country..." "...would love to visit you again very soon."